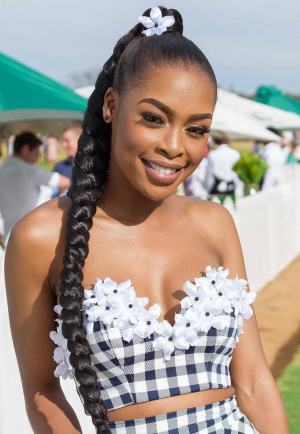 K Naomi (born Keitumetse Naomi Noinyane on 13 July 1991) is a South African model and television presenter who rose to fame presenting the Top One entertainment magazine show Top Entertainment, in 2012, alongside Ayanda Thabethe, Chanelle Ellaya and AKA. In 2018 she appeared on the 1Magic original telenovela, The River, which stars Presley Chweneyagae, Moshidi Motshegwa, Hlomla Dandala, Lawrence Maleka, Lunga Shabalala, Larona Moagi and Sindi Dlathu with Don Mlangeni Nawa. K Naomi was in a relationship with actor Lunga Shabalala. Their relationship ended amid reports that Lunga Shabalala was unfaithful and had engaged in a relationship with famed actress Omuhle Gela. K Naomi later reflected, "Omuhle and I don't get along, Lunga and I still speak. Guys, I dated Lunga for a long time so I can't really cut him out of my life because of one person." K Naomi was in a relationship with famed DJ Shimza, the relationship ended in a public Instagram meltdown. "I made you my world and you didn't get it. Now it's an issue that I'm living my life without you," K Naomi. "Good girls come out last because we are never enough", she said to Shimza via Instagram stories and went to to thank him for "breaking" her. This page was last edited on 20 February 2019, at 21:13.